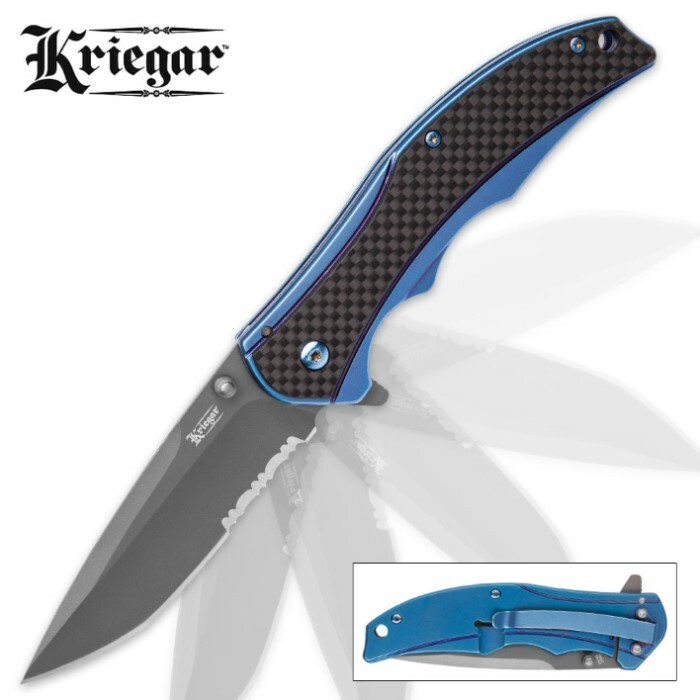 Kriegar Aeon Assisted Opening Pocket Knife - Gray Titanium-Coated Blade - Metallic Blue Handle | BUDK.com - Knives & Swords At The Lowest Prices! The Kriegar Aeon has it all - sleek, industrial styling; professional grade materials and rock solid construction. It makes quick work of practically any cutting task, no matter how rigorous or delicate. Cleaning freshly caught fish, cleaving thick rope, carving wooden figurines from a tree branch - nothing's off limits to this all-purpose folder. Simply put, the Aeon is everything you want in an everyday carry, all at a price well within reach of even the most budget-conscious knife enthusiasts. Forged from premium 420 stainless steel, the blade is rugged, robust and razor sharp. 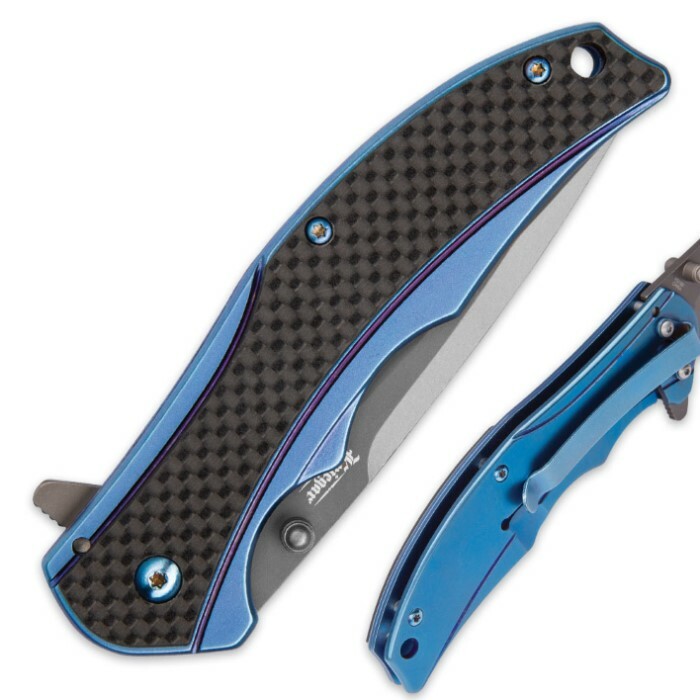 It features a unique profile that combines the renowned versatility of the classic drop point blade with the incredible penetrating power of the tanto. Two distinct edges - a carefully honed fine edge and a bitter serrated edge - represent another smart mashup, expanding functionality and boosting cutting potency. The blade's chic, nonreflective gray titanium coating bolsters corrosion resistance, allowing for extended use in even the wettest environments. Regardless of conditions or locale, however, you can be sure your Aeon blade is poised and ready for action. It deploys in the blink of an eye - requiring just one hand to do so - thanks to the Aeon's advanced, velvety smooth assisted opening mechanism and accompanying blade spur and ambidextrous thumbstuds. The Aeon's handle is every bit as impressive as its blade, boasting tough stainless steel construction and a vibrant metallic blue finish. A black carbon fiber insert, enhanced by a distinctive weave pattern, beautifully offsets the surrounding cobalt blue hue. Smart form, generous finger choils and impeccable balance impart the Aeon with incredible hand-feel, reducing fatigue and improving control. As if all this wasn't enough, the surprisingly affordable Aeon represents an exceptionally rare value you simply can't afford to pass up! 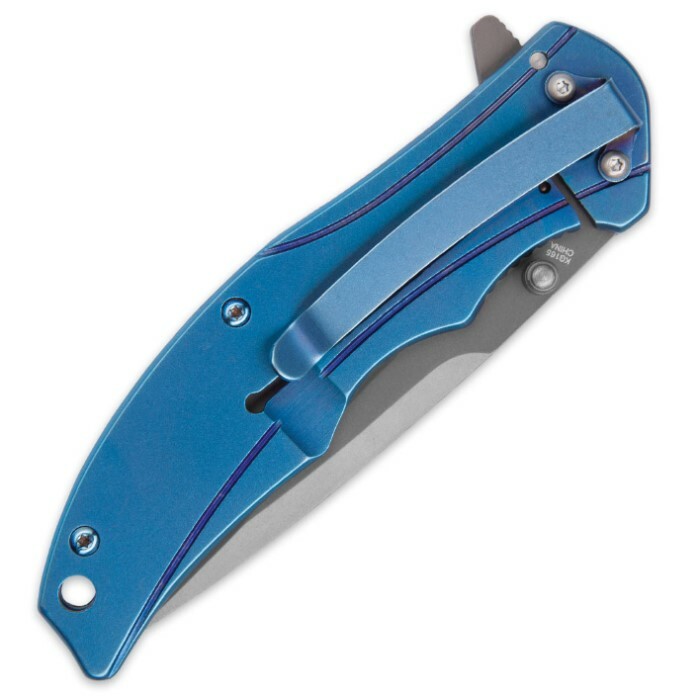 Brawny, bold and beautiful, Kriegar's "Aeon" Assisted Opening Pocket Knife always gets the job done - always efficiently, always with with style, and all without breaking the bank. This is a great knife. Has a great feel, really great blade, and unique style. I really like the quality of the Kriegar brand. This is my 4th Kriegar knife from BudK. You won't regret this purchase.